From wine to waterfalls, craft brews to world-class museums, Americana Villages to metropolitan nightlife it’s all here in the Finger Lakes Region of New York State. Our area is a 9,000 square mile, four-season playground, set against a backdrop of Mother Nature’s best work. Whether you are a big city traveler, an explorer of gorges, trails and waterfalls, or have a love of scenic drives through rolling hills and burgeoning craft beverage trails, your perfect vacation can be found with us. The Finger Lakes Region is home to eleven glacial lakes and one Great Lake. It’s no wonder how we got our name. Look at a map and you will see water spread like fingers across our region. Native American legend has it that these lakes were left behind by the Great Spirit who blessed this land with his hands. That legend is echoed in the names of these fresh water lakes: Skaneateles, Otisco, Owasco, Cayuga, Seneca, Keuka, Canandaigua, Honeoye, Canadice, Conesus and Hemlock. 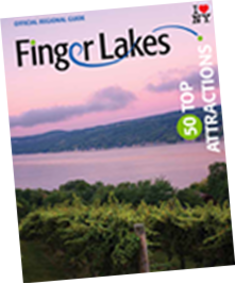 From wine to waterfalls, craft brews to world-class museums, Americana Villages to metropolitan nightlife it’s all here in the Finger Lakes Region of New York State. When you are done with the water, hop on a trail and see where it takes you. We’ve got the traditional trails through state parks, biking trails and hiking trails, but we’ve also got wine trails, beer trails, a cheese trail and a sweet treat trail. The chocolate trail will satisfy any sweet tooth in Corning and the Apple Tasting Tour will take you through farms, orchards, farm markets and more for the best fall flavors and fun around. Quirky tours and funky flavors are our specialty. Grab a grape pie, dig in to the original Dinosaur BBQ, or try Rochester’s legendary garbage plate. The original ice cream sundae was created right in Ithaca and “stretch bread” is a favorite in Skaneateles. Or, find a fresh farm market or farm-to-table restaurant for locally-sourced creativity and taste. Spend enough time here and it might just start to feel like home. It was, after all, for historical figures and visionaries like Susan B. Anthony, Frederick Douglas, George Eastman, Mark Twain, Clara Barton, William Pryor Letchworth and Matilda Joslyn Gage. Their spirit of innovation, determination, entrepreneurship and philanthropy is still integral to our region today and can be found in historic houses, on tours, and in museums across the region. We are a place of creators, artists, wine makers, craft brewers and amazing chefs. A place of knowledge, discovery, and culture. A place to learn. A place to relax. A place to reconnect with family on the water or in the woods. A place to appreciate nature. We are the Finger Lakes Region of New York State.